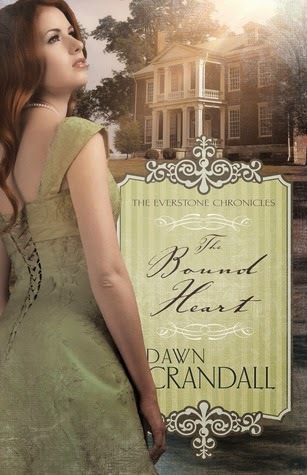 I felt prepared when I picked up Dawn Crandall's The Bound Heart. Having just finished the first installment of the Everstone Chronicles, I felt I had a handle on the author's style and I thought I had a good idea as to where the story might go. Looking back I can honestly say I was right in a lot of ways, but I was also surprised at certain subplots and have no problem admitting that I enjoyed book two more than I did book one. Like its predecessor, I felt the novel character heavy. I was actually very happy that I'd tackled the books in order as it made it easier for me to keep everyone straight in my head. Again, I found I appreciated Crandall's voice and the balance she struck between faith and fiction. Unlike its predecessor, I felt Meredyth's story more dramatic and historically appealing. Her situation posed a lot of interesting insight to the social order of the day and highlighted the disparity in consequence suffered by men and women who defied those dictates. I'm not a huge fan of light inspirational fiction, but The Bound Heart proved both enjoyable and thought-provoking. It is slow in places and a bit drawn out toward the end, but I liked the story and find myself looking forward to the next installment of the series.